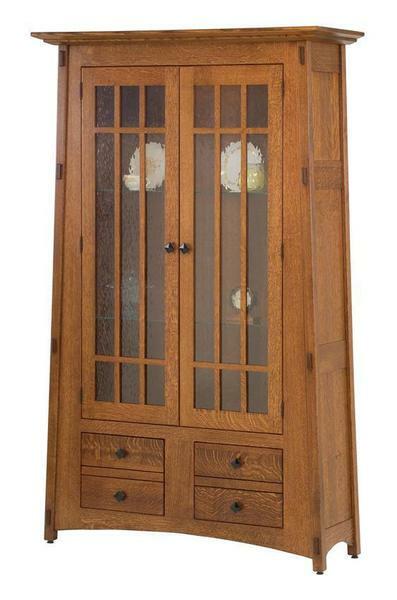 Our beautiful McCoy Bookcase is proudly Amish handcrafted in Indiana. This American made bookcase is made from oak wood, cherry wood, rustic cherry wood, quarter sawn white oak wood or brown maple wood. Custom woods are available upon request as well for this Amish bookcase. All drawers in this collection are dovetailed with brown maple sides and walnut fronts and backs. The drawers are able to accommodate file folders. This Mission bookcase has a distinct contemporary, modern look to it. Amish furniture is often thought of as only being country style and traditional looking. This urban bookcase proves that the Amish can design furniture for the 21st Century!